A lot of us spend quite a bit of money going to restaurants for dinner so we can get our favorite meals. 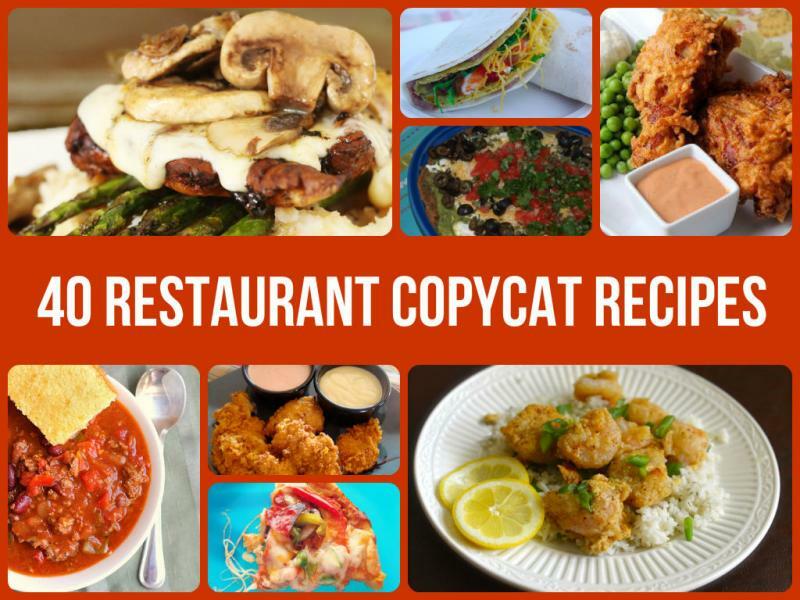 Well this is a great roundup of some of the best copycat recipes that restaurants have to offer. Have a look through this list today and have your favorite restaurant meal at your own dining room table. Add chicken breasts, chicken broth, 2 teaspoons Italian seasoning, 1 Tablespoon dried minced onion, 1 teaspoon paprika, salt, pepper, diced tomatoes, carrots, potatoes and water to a large saucepan over medium heat. Simmer until the chicken is cooked through and the veggies are tender. Remove chicken breasts, shred and add back to the pot. Add the beans and heat on low for 30 minutes. Add the fresh chopped spinach and cook for 5 more minutes. Taste and add the remaining 1 teaspoon Italian seasoning, 2 teaspoons dried minced onion and 1 teaspoon paprika, if needed. Stir in the cream cheese until completely combined. Last, add the grated Mozzarella and stir until combined.